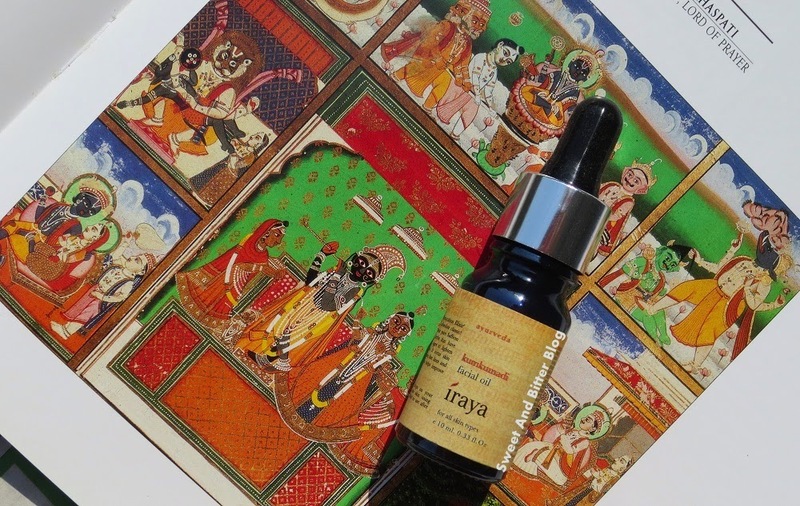 IRAYA Kumkumadi Facial Oil Review // Better than Kama Kumkumadi Thailam? The review of Iraya Kumkumadi Thailam has to be one of the most awaited review of recent times on Sweet And Bitter Blog. As I recommend and got loads of benefits from Kama Kumkumadi Thailam, everyone asked - Is Iraya better than Kama Kumkumadi? - when I shared on Instagram that I have started using Iraya. So, after a month, here are my views. Packaging - Glass bottle with dropper. No seal or outer carton like Kama Kumkumadi. Price - Rs 995 for 10ml (Rs 99.5 per ml whereas Kama is for Rs 112.5 per ml at Rs 1350 for 12 ml). Both costs almost the same. Availability - Online and their own store only. Ingredients - Just like Kama, Iraya is 100% natural. But, the formula of both the facial oils is different. 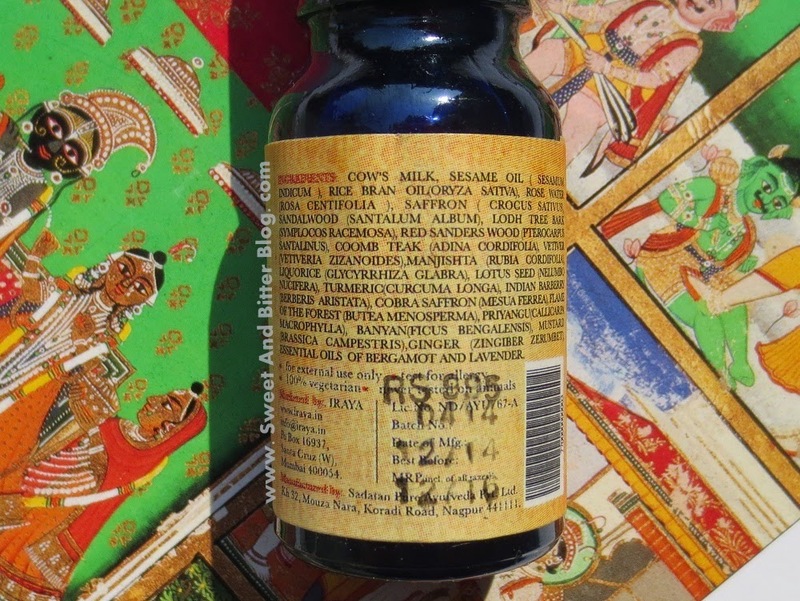 Cow's Milk, Sesame Oil ( Sesamum Indicum ), Rice Bran Oil(Oryza Sativa), Rose Water ( Rosa Centifolia ), Saffron ( Crocus Sativus), Sandalwood (Santalum Album), Lodh Tree Bark (Symplocos Racemosa), Red Sanders Wood (Pterocarpus Santalinus), Coomb Teak (Adina Cordifolia), Vetiver (Vetiveria Zizanoides), Manjishta (Rubia Cordifolia), Liquorice (Glycyrrhiza Glabra), Lotus seed (Nelumbo Nucifera), Turmeric(Curcuma Longa), Indian Barberry (Berberis Aristata), Cobra Saffron (Mesua Ferrea), Flame Of The Forest (Butea Menosperma),Priyangu (Callicarpa Macrophylla), Banyan(Ficus Bengalensis), Mustard (Brassica Campestris),Ginger (Zingiber Zerumbet), Essential oils of Bergamot and Lavender. Texture - Light facial oil almost in the same lines of Clarins Lotus Oil. Not as thick as Kama Kumkumadi. It is absorbed faster than Kama. I still use the trick of using rose water before applying kumkumadi. It makes it easier to absorb. I do not have to work much on it. Also, as it is lighter, it is easier for summer. I have started to feel Kama one a little heavy for this weather now. Smell - Iraya smells like citronella. Nothing in common here with Kama. Some people love citronella but unfortunately, I am not among those. I found it tough to use initially. Now, I am used to it. Effects - Well, last month was not the best time to review any skincare products. Around the start of Feb, I saw lot of pimples coming on my face. I was not having the best time and worried about a lot of things. Obviously, I was not even taking care of my skin. The pimples went away by end of Feb but 3-4 left tiny marks. I started using Iraya but was not liking the smell so, was skipping it. Then there was too much travel in March and my skin was dry and flaky. My skin was cracking. I luckily had the Iraya Kumkumadi Balm (more on that later). After I returned home, I started using it religiously for the last 3 weeks, I am using nothing but this. I can see the glow of my skin returned. Frankly speaking, Kama has really worked for my skin but I was on my third bottle when I realised the effects are not as prominent and quick as it was previously. Iraya helped me get that back. Even the marks are now facing. It is not as fast in fading marks as Kama but sadly Kama was not working much for me. 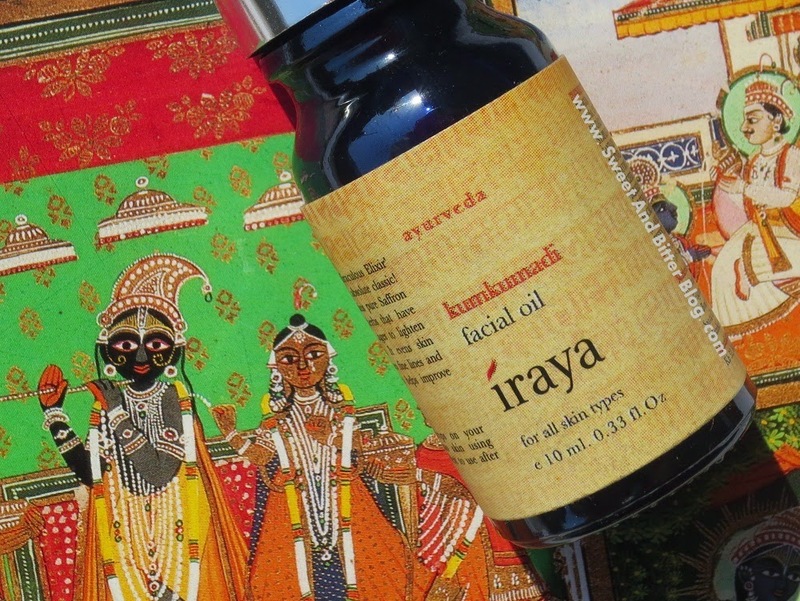 Is Iraya Kumkumadi Facial Oil a dupe of Kama Kumkumadi Thailam? NO. Both have different formula, texture, smell and effects. They are very very different. 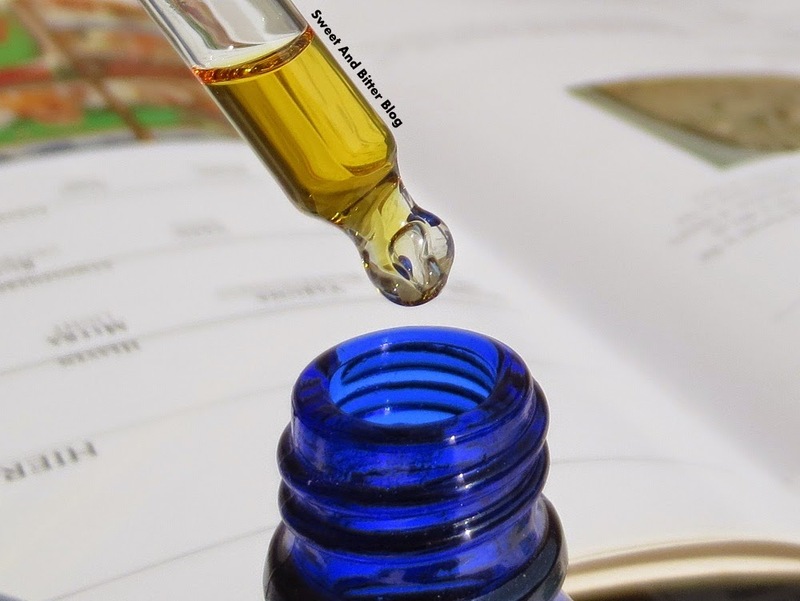 The only thing common is that both are great natural facial oils without any chemicals . Is Iraya Kumkumadi Facial Oil better than Kama Kumkumadi Thailam? Both are different. If you have not used either then go for Iraya as it is lighter and apt for summer. You can try Kama if you live in dry parts of the country. If you wish to fade marks then buy Kama. Iraya takes a bit longer than Kama but works as well. If you are using Kama for long and thinking that it does not have the same effects as it used to have then, switch to Iraya.